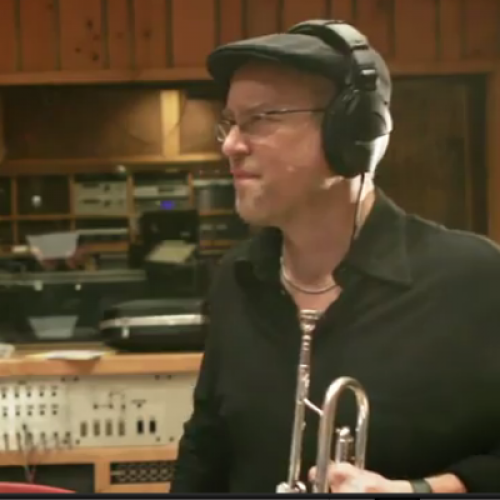 Dave Douglas, the jazz composer and trumpeter, has made quite a bit of adventurous and unusual music over the past two decades, and I’ve written with admiration of it in the pages of TNR. He has made music more original than his new album, Be Still—a collection of Protestant hymns, mainly, performed with Douglas’s new group, augmented by the young Appalachian-style vocalist Aoife O’Donovan, and released last week on Douglas’ label, Greenleaf Music. But he has never done anything braver and, by my measure, more important. What’s extraordinary about Be Still is its beauty, its lack of affect, the stillness at its heart. It’s important not because it sets a new agenda for contemporary music, but because it has no cultural strategy. It’s a personal piece of work that grew from the death of Douglas’ mother, Emily, last year. Before she died, she had given Douglas a list of hymns to be played at her memorial service, and Be Still is made up mostly from that list. On one level, Be Still connects to the great tradition of secular artists such as Duke Ellington, Elvis Presley, and Bob Dylan taking unexpected turns into sacred territory. (Saved, the second of Dylan’s born-again albums, has some of his most lucid and forceful writing, and, I think, the best singing of his career.) In devotional music, musicians have to devote themselves to something other, something larger than their selves, and the results can seem miraculous. It would be disingenuous of me not to mention that I’m moved by Douglas’s album in part because my own mother died a few weeks after Douglas’s, a year ago this week. I’m not going to misuse this forum by indulging the persistent grief familiar to everyone who lives with a loss. I’ll just end with a clip of Aoife O’Donovan in a live performance of a Bob Dylan song my mom always liked. Correction: The original version of this post contained a misspelling of the name of Aoife O’Donovan, a vocalist appearing on Douglas's album.